Here in my ninth year as a Blues aficionado, I marvel at the artists I have yet to discover. 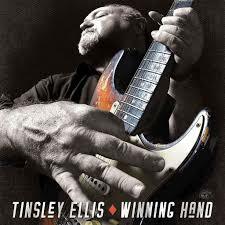 Tinsley Ellis has a 30 year career in the Blues and just released his 19th album (the fifth in five years! ), returning to his home at Alligator Records from his own label “Heartfixin.” The result is an excellent rocking blues album with such an emphasis on electric guitar that the liner notes say which of his five favorite classic guitars is featured. He is ably assisted by veteran keyboardist (and co-producer) Kevin McKendree, well known to Delbert McClinton fans like me. Steve Mackey on bass and Lynn Williams on drums complete the lineup. The CD has 10 tracks, nine originals and one cover. Leading off, we have “Sound of a Broken Man” lamenting lost love with a good beat and some “wah-wah” on the guitar solo. Second is “Nothing but Fine” a good toe tapper about newfound love. “Gamblin’ Man” is next, giving us the title (in the lyrics) and a slower, Chicago-style beat. “I Got Mine” is fourth with Tinsley professing his love for his woman, and a great guitar riff at the end. On to “Kiss the World,” a hard edged lament about a failure to recover lost love. “Autumn Run,” at sixth place, is the softest and moodiest song, with more good solo work at the end. Seventh we have “Satisfied” with some heavy keyboard work like Jerry Lee Lewis” and a fast tempo. Next is “Don’t Turn Off The Light,” another anguished tune about lost love. The sole cover is Leon Russel’s “Dixie Lullaby” ably covered by Ellis and McKendree`s piano work. We finish up with the longest track “Saving Grace” (8:49) with more great guitar work. Last year Tinsley Ellis came to Workplay and I missed it, a mistake I won`t repeat! This is a fine album top to bottom and well worth adding to one’s blues collection. I can’t wait to listen to his earlier solo CDs, and his work with the “Heartfixers.” Maybe his new tour will bring him here (from Atlanta)!